Cannot make enough of these little treats this week: pleasing co-workers, friends, family and fashionistas all week long. Super easy recipe with uber-incredible results! Box in 1/2 lb. boxes (typically will hold 6-cookies per box) and tie with holiday-inspired raffia or ribbon bows. (I love the 1/2 lb. boxes with the clear opening so you can see how adorable they are!) This specific recipe has been in my family since I was a wee-one. Heat oven to 375 degrees. Combine 1/2 cup sugar, brown sugar, butter and peanut butter in a large bowl or stand mixer. Beat at medium speed until light and fluffy (about 1-2 mins). Add egg, vanilla, and salt; continue beating until well mixed (1-2 mins). Add flour and baking soda. Continue beating, scraping bowl often, until well mixed (1 to 2 mins). Shape dough into 1-inch balls. (Trust me, just when you think your dough ball is too small, it’s probably just perfect!) Roll each ball in the 1/4 cup sugar. Place 2-inches apart onto ungreased cookie sheets. Bake for 8 to 10 minutes or until very lightly golden brown. 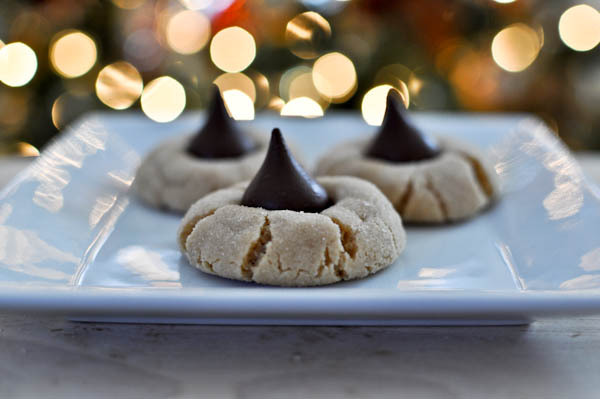 Immediately press 1 unwrapped chocolate kiss in the center of each cookie. Remove from cookie sheets, cool completely on wire racks. Makes 4 dozen cookies ... and creates as many happy faces!